Positive: Nice performance; long battery life; fast fingerprint sensor; support LTE; metal case; solid workmanship; nice display. Negative: Weak hardware. Model: The BQ-5510 Strike Power Max 4G is a large and affordable smartphone with a huge battery. In addition to the attractive price, the smartphone received a huge battery with a capacity of 5000 mAh, a large bright 5.5-inch IPS display, a fingerprint sensor and Android 7.0. It is made of plastic with metal inserts, giving the device a strict and solid look. The design of the novelty resembles other recent models of the manufacturer, including flagship ones. From this, the Max 4G only wins. It definitely looks more expensive than its price.Weight and thickness are impressive. Despite being a smartphone with a 5000 mAh battery, the BQ-5510 only weighs 198 grams. The smartphone has a 5.5-inch display with a resolution of 1,280 x 720 pixels. A low resolution consumes less battery life, requires fewer CPU resources and allows lowering the price. It is a quality IPS panel with a high maximum brightness. The Max 4G can be used outdoors in direct sunlight and the information on the screen remains readable. The viewing angles are also excellent, the picture does not fade even when viewed at an extreme angle. The display is flat, without the popular 2.5D rounding. However, it is more difficult to break, which is an advantage. In contrast, almost any fall becomes fatal for a convex glass. The smartphone received a 13 MP main module and a front camera of 8 MP. The camera is enough to take a picture of the landscape, a group of friends or a document. The BQ Strike Power Max 4G gives nice photos in the daytime and at night a bright LED flash comes to the rescue. The camera app offers additional modes and settings including manual mode for setting ISO, shutter speed, exposure, and white balance manually. The 8 MP front camera makes bright and clear photos, which are not a shame to share on Instagram. 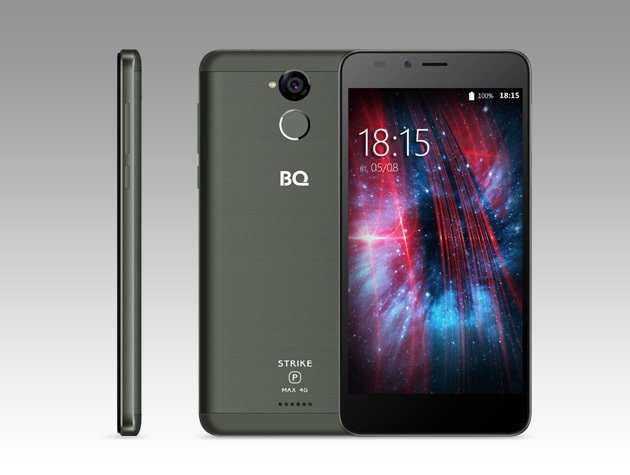 The BQ Strike Power Max 4G features an very large battery of 5000 mAh. Given the not too greedy stuffing of the Max 4G, such a battery gives an outstanding autonomy. Even with the most active use of social networks and the Internet, the device lives for two days. And less active owners will get three or even four days. Inside the smartphone, there is a quad-core MediaTek MT6737 processor 1 GB of RAM, and 8 GB of storage. Of course, the storage capacity can be expanded with a memory card. The hardware is not the limit of dreams, but is is sufficient for all main tasks. The interface works fast, all applications open without delays.